As summer approached its close, Charlene Myke sat down with one camper in a wheelchair to talk about her favourite part of spending a few weeks in the great outdoors. There was some excitement – and music – in the air as they chatted, but the camper’s answer surprised Ms. Myke: their dance. When Ms. Myke assembled a roster of community leaders in Aurora and Newmarket to kick off the inaugural Aurora/Newmarket Dancing With the Stars event to benefit Easter Seals last year, she and her hoofers were dancing for those who can’t. This year, however, they are doing it for people like that girl in the wheelchair and others who, thanks to Easter Seals, very much can. 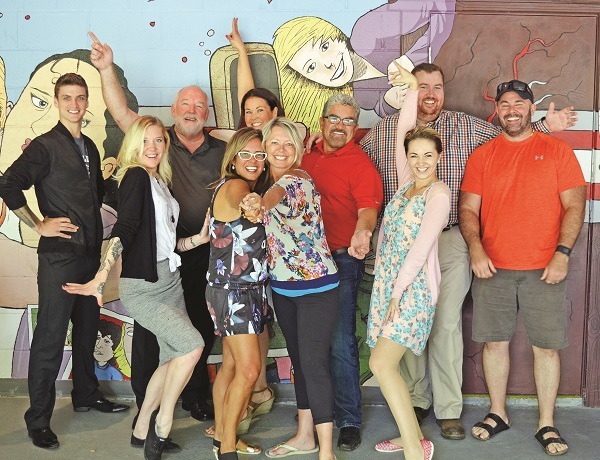 This year’s crop of community leaders are now in the heat of training – and fundraising – ahead of this year’s event, which takes place Wednesday, October 5, at The Manor at Carrying Place. Burning up the dance floor with Patrick Derry, Kelly Stacey, and Anastasia Trutneva of Aurora’s Artistica Ballroom Dance Studio are fitness instructor and philanthropist Andrea Peterson (wife of Newmarket-Aurora MP Kyle Peterson); long-time community volunteer and entrepreneur Brian North; former Newmarket councillor and current businessperson and volunteer Chris Emanuel; videographer Jennifer Buchanan; marketing leader and philanthropist Nikki Pett; graphic designer and self-described “fierce supporter and enthusiast of the community” Rob Clark; and infrastructure entrepreneur Tony Di Pede. “You hear about Easter Seals, but to be able to see it firsthand and seeing how the kids all have this place where they can go and be themselves and not have to worry about their disability because everybody has a disability is huge,” says Ms. Peterson, who had an opportunity to visit the Easter Seals camp earlier this summer, on why she signed up for the challenge. “They are baking muffins for their camping trip, or they are eating batter out of the bowl, they are taking part in this huge tree trekking thing that I wouldn’t do myself because I would be too terrified, but they are sitting there strong, confident and feeling great about themselves. While Mr. Derry says Ms. Peterson is “having the best time trash talking everybody else in the competition,” he and his fellow dancers are taking the initiative, for the second year in a row, very seriously. Ms. Trutneva agrees, saying they agreed to do it as soon as Ms. Myke approached them. Since stepping up to the plate, the dancers have been hitting the pavement fundraising by selling tickets and tables to the event, soliciting support online through their individual webpages, and hitting social media with their dance moves. Mr. Clark has even inserted himself into some of the great dance movies of the last two decades, taking on the mantle left by Natalie Portman in Black Swan. “I think stepping outside of your comfort zone is probably a healthy thing from a character-building perspective as well,” says Mr. Clark. Adds Mr. North: “Last year I saw the dancers and admired them so much, but I thought there is no way I can step outside my comfort zone like this. As much as I have stubbed [Kelly and Anastasia’s toes] and tripped them, pushed them around, and however much they laugh at me, it is about giving back to the kids and giving them the opportunity to do something fabulous. If you want to be a little fabulous yourself by contributing to a dancer of your choice or securing yourself a place to watch them shake it, head over to www.easterseals.org/dancing-with-easter-seals-stars-newmarket-aurora. Leading up to the event itself, The Auroran will profile individual dancers.